In Thailand we learn to cook at home. Every mother is a "teacher" and a culinary guru. Family recipes are passed down from one generation to the next. Meals are always shared family affairs and are an important part of our cultural heritage. 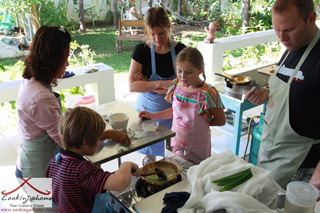 At Cooking@home all courses are taught in clear and easy to understand English. Tips and suggestions are offered throughout, and students are guided through the cooking techniques required for each recipe. Classes range from beginners to advanced level and you can opt to be taught individually or in a small group. Let us know in advance and we will be delighted to tailor courses to suit your individual needs. We are experienced in teaching people from all over the world with widely varying cookery knowledge and culinary skills, ranging from groups with disabilities to professional chefs. We regularly receive groups of students from abroad to teach them courses we have designed in collaboration with staff from their school, college or university. Our aim is to make the pleasure of preparing and savouring authentic Thai food accessible to everyone. It is a source of great joy and satisfaction for us that all our culinary students return home with the ability to share a true taste of Thailand with their families and friends. Each day, our students are picked up from Chiang Mai and driven to the cookery school. On a typical day our lessons begin with a trip to a local country market where you will be guided around and learn how to select and buy the fresh Thai ingredients that will be needed for that day's cooking lesson. 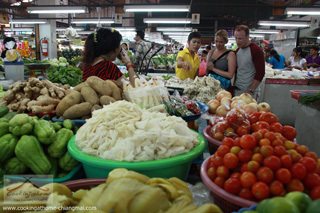 For many, this tour of the morning market is an unforgettable experience in itself, leaving them with lasting memories of new sights, sounds and wonderful spicy aromas, as well as a broader knowledge of Thai fruits, vegetables and spices. This experience and new knowledge is especially useful to those who want to impress their friends back home with delicious Thai cuisine. Returning to the delightful semi-rural setting of the cookery school itself, Pom will take you through every stage of the cooking process until, at the end of the session, you will have the opportunity to taste and eat your own creations. You will learn by doing, not merely watching, so each course is full of activity and fun. Every student receives a copy of our full-color, professionally printed Cookery book. This book contains information about common ingredients in Thai cooking and all our recipes. It will help you reproduce the tasty dishes you have learned, and more, in the comfort of your own home kitchen. Cooking@home Thai Culinary School is located away from the hubbub of the city, yet just 14 kms from the centre of Chiang Mai (less than 9 miles). It is an ideal home-style learning environment in a charming open-air Thai style kitchen, surrounded by aromatic herb gardens and overlooking rice paddies. 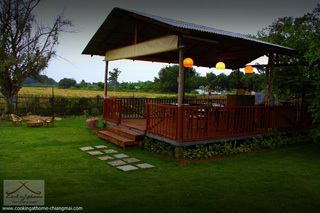 Our students can relax in a tranquil and cozy atmosphere, far from the madding crowds. Our superlatively hygienic premises operate at the highest standards of cleanliness. Students work with top quality cooking utensils, and a separate work station is provided for each student. We believe that our inspirational environment will enhance your cooking experience. We cannot judge ourselves and tell you that we are the best, but we can assure you that what we offer is second to none and that you will not be disappointed if you decide to accept Pom's invitation to join us for a very special day of cooking and savoring Thai dishes at Cooking@home. Don't just take our word for it, see what our past students have to say about us on TripAdvisor. Copyright © 2009, Cooking@home Chiang Mai Thailand Tel: 086 911 41433. All rights reserved.